Put on the nostalgia goggles. The Darkening of Tristram has returned to Diablo 3. 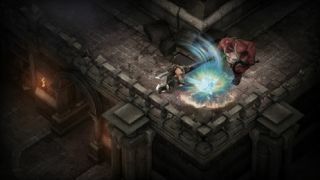 For the last few years, Blizzard has celebrated the original Diablo’s anniversary by hurtling Diablo 3 players back into the past, into an homage of its progenitor. Take a trip back in time and you’ll net yourself a few rewards, including a wee Butcher minion that follows you around, menacing people. Blizzard originally framed The Darkening of Tristram as Diablo recreated inside Diablo 3, but it’s more like a Greater Rift. After hopping through a portal in Adventure Mode, you’ll find the game transformed by a pixelated filter, but the enemies and tilesets are largely straight out of Diablo 3. There are a few fun nods to Diablo, however, like fighting the original version of the Butcher or encountering a few bespoke areas inspired by the first game. There are extra bosses and encounters that you’ll need to explore to discover, too. If you’ve already run through the event in previous years, there might not be much incentive to do it again, but if you missed something, now’s your chance. The portal opened yesterday evening and will close on January 31 at 4pm PST. With the overwhelmingly negative response to the Diablo: Immortal announcement, hopefully 2019 will bring with it more than just returning events. We do know more Diablo projects are in production, at least, and possibly Diablo 4.